Monkey Go Happy Marathon 2 is the new point and click puzzle game from pencilkids. Your objective is to make the little yellowish monkey happy by solving puzzles that includes finding hidden objects, shooting stuff and other things that you think would make a sad monkey smile. Just think cleverly and your should be able to make the little ape glad. For those who don't know yet, this game is the sequel to the previous Monkey Go Happy Marathon game that was released in 2011 and now it just got better with brand new puzzles and levels. 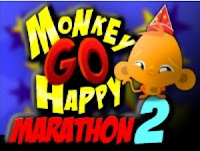 Meanwhile, here is Monkey Go Happy Marathon 2 walkthrough with the guide to solving all the levels in this game.